The charges filed by Assitant United States Attorneys Matthew Podolsky, Robert L. Boone, and Robert B. Sobelman alleges that Avenatti of attempting to extort Nike for up to $25 million by threatening to release damaging information about the company. He now faces five counts of conspiracy to commit extortion and was arrested yesterday. He also faces a separate case for wire fraud and bank fraud in the Central District of California. Amid the charges that the 48-year-old is currently facing, Avenatti hits back at the company. In a late night tweet, the attorney accused Nike of making money out of the backs of student-athletes, exploiting them and their families. “College athletes deserve to be paid. Legitimately. Colleges/the NCAA make billions off their backs. But companies like Nike should not rig the system and take advantage of the athletes/ their families at the same time they bullsh**t America and act like they are innocent,” Avenatti said on Twitter, Thursday morning. He previously denied the allegations against him on Monday and began tweeting what he called evidence of the scandal the day he was arrested. He was released on a $300,000 bond in the New York case and has repeatedly proclaimed his innocence of all charges. Prosecutors in the case said that Avenatti met with Nike’s attorneys to demand a payment ‘to make a multi-million dollar payment” and make an additional 1.5 million dollar payment to an individual that the lawyer refers to like his client. The client was said to be an AAU coach, whose team have previously made deals with Nike. According to the affidavit, Nike refused to renew the contract with Avenatti’s client further. Avenatti claimed that his client has evidence that would prove that Nike employees have paid the families of high school players “similar to conduct a rival company” that had recently been subjecting of criminal proceedings in the District. He named three high school players in particular and indicated that his client is well aware of the said payments as well. 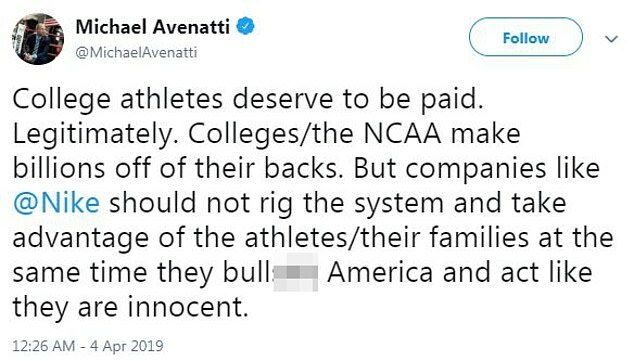 Earlier Monday, Avenatti posted on Twitter that he will be holding a press conference to disclose a major high school/college basketball scandal by Nike that he and his team have discovered. “This criminal conduct reaches the highest levels of Nike and involves some of the biggest names in college basketball.” Nike’s shares reportedly fell as much as 1.3% after the tweet of Avenatti’s supposed expose. The complaint characterized the unnamed CC-1 as an attorney licensed to practice in the state of California and is similarly known to have represented celebrities and public figure clients like Avenatti. The attorneys of Nike said that they asked for time from Avenatti and the defendant gave them until Tuesday, two days after the alleged meeting. “If [Nike] want to have one confidential settlement and we’re done, they can buy that for twenty-two and half million dollars, and we’re done[…] Full confidentiality, we ride off into the sunset,” Avenatti allegedly told Nike’s lawyers as indicated in the filed court document.